Join us June 27, 2019 for NuView's Summer client networking event! You'll have the chance to learn more about self-direction, meet other like-minded investors and hear from some of the industry's top experts!Register Now! We all have that one person we’d do anything for. This is someone we owe the world to, whether for something they’ve done or how they’ve impacted us. To me, that person is my father, a man who’s done it all for me. He’s taught me so much about life, all while managing a poorly dealt hand with his own health. He would give the shirt off his back without thinking twice, and he has. My entire life, I wondered how I would ever repay him, and for years, I was without an answer. 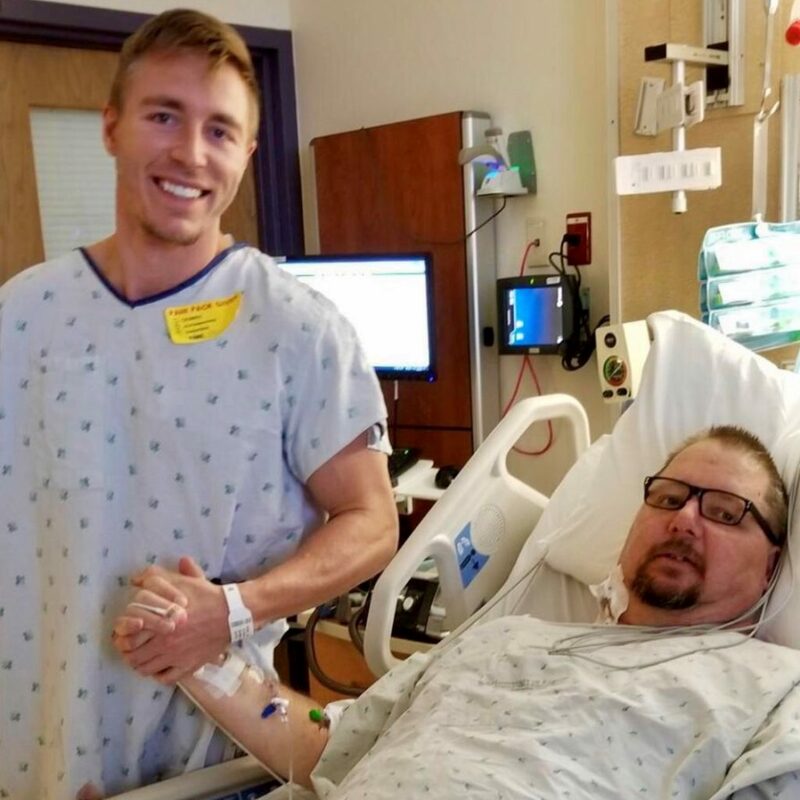 When my father asked me to be his living kidney donor last summer, tears came to my eyes. Years ago, when I first found out he would one day need a transplant, I hoped so desperately that I could be the one he’d ask to be his donor. The alternative to my donation would have been immediate placement on dialysis for the rest of his life, and his name would have been added to the organ donor waitlist. With all my father had been through, that wasn’t a life I was prepared to watch him live. I don’t recall the exact words of the conversation when my father asked me, but I do know I had agreed to go through with it before he could even finish talking. There were no “ifs, ands, or buts” about it. Never did I question what the process would look like, what my recovery may look like, or what I would get in return. This is the man who taught me to give without expectation—to do the right thing, even when no one is watching. The night before surgery, nerves really started to set in. It was a sleepless night, tossing and turning, excited yet nervous about our big day. Just 115 days after I began the donor selection process, I admitted myself for surgery at University of Illinois Health in Chicago. If I had to describe the morning in one word, I’d say it was emotional, going through surgery preparation, knowing what was to come, and the gift I was about to give. My father got out of surgery a few hours after me, and while I didn’t see him that day, the news I received made me ecstatic. The surgeon reported my kidney was “working like a champ” for my father. That’s when it hit me– everything we had worked toward in the past six months, and for him, even longer, finally came to life. My goal the night of surgery was to walk to his room, just down the hall from mine. I spent a few hours wrestling with the daunting idea of standing up, let alone walking, just hours after having an organ removed. I finally got the courage to give it a shot, and I was so confident I could stand up on the edge of the bed and make the trek down the hall, but within seconds of standing, I had to sit back down, nauseous and extremely frustrated for having tried and failed. I laid back in bed and tabled that same goal for the next morning. The next day, before I could hardly open my eyes, I was greeted by him walking to my room instead, with the assistance of his nurse. He had beaten me to it, but how powerful that was to see. A few hours later, I tried again to make it to his room and succeeded. It wasn’t easy, and I was hunched over in pain, but I was determined to make it. This was a massive moment for me! This was exactly what I had dreamed of: standing beside his bed, shaking his hand, after having given him, my own father, a new lease on life. I had been waiting my entire life for the opportunity to give back to this man who had given so much to me for the past 30 years. I couldn’t have been more grateful to have had the chance to do something so magical to significantly improve the quality of his life, and even extend it for years. Here we are, a month after surgery, and I am happy to report we’re both recovering exceptionally well. What surprised me most is that he experienced less pain and recovered quicker than I did, which is commonly the case. My favorite part of the entire situation is the fact that he feels like a new man today. We’re both back to work, and I would say I came out of the entire process unscathed, with the exception of a small lifting restriction and some scars that tell a breathtaking story. If I could do it all over again today, even for a complete stranger, I would. The pain from the surgery was a small price to pay for what it’s doing for my father and my entire family. I’m not saying each of you should go and give someone a piece of your body, but this whole process taught me an extremely valuable lesson about giving without expectation. Giving without expectation is something we can all do every single day. It’s something I encourage everybody to do a little more of. There’s so much to be said about doing the right thing, even when no one is watching. © 2019 NuView IRA. | NuView Trust is not a fiduciary and only provides services to self-directed accounts that are non-discretionary and/or administrative in nature. The Account holder or his/her authorized representative must direct all investment transactions and choose the investment(s) for the account. NuView Trust has no responsibility or involvement in selecting or evaluating any investment. Nothing contained herein shall be construed as investment, legal, tax, or financial advice or as a guarantee, endorsement, or certification of any investments.